February 12, 2016 – Today’s author, John Taliaferro, pans the camera lens of history just to the side of two great American presidents to focus on a man who worked for both. 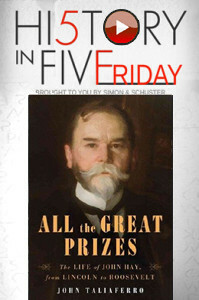 The book is All the Great Prizes: The Life of John Hay, from Lincoln to Roosevelt. John Hay may not be a name that jumps out at people today, but he had a front-row seat with Abraham Lincoln in the early 1860s, and Theodore Roosevelt in the early 1900s.